She soon became deeply in the heart of the New York avant-garde. Her paintings demonstrated repetitions’ concept and minimalism. Her sculptures featuring every day items covered with a proliferation of repeated forms suggested a dreamlike world and were first exhibited alongside work by Andy Warhol, George Segal among others in New York,Sept 1962. This was the first exposition of the american pop-art movement. Concious of her position as a female,Asian artist in the predominantly white, male New York art world, she went into performance and happenings (1966) and created work that commented on her double “outsider” status. After the rise of hippie culture (1967), Kusama seeing the revolutionary flower children as kindred spirits and potential collaborators and audience for her works, she embarked on a period of performative experimentation. In her Body Festivals naked participants were encouraged to paint polka dots on each other’s bodies (dots appear often in her works). After returning to Japan in 1973 she continued evolving her concepts. Painted the largest so far canvases of hers. Also did sculptures out of stuffed cushions and combined these to create large multi-part installations. She did constructions with her signature motifs – phallic shapes, which she extended and elongated into snake-like forms. 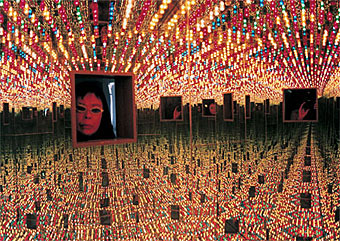 In the late 1990s, Kusama returned to making room-sized installations. In “I’m Here,but Nothing” she covered a room and its furnishings with fluorescent spots which glow in the dim light. For Kusama the polka dot can be visual shorthand signifying her hallucinatory visions ( during which she senses the physical world is overtaken by endlessly repeated forms).